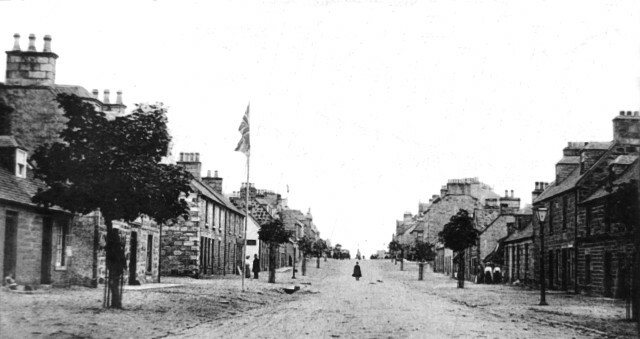 An old view of the High Street, at the western end looking east. Bearing in mind the state of the road and pavements, any thoughts on a date for this picture? Hello Dave. The flag pole is outside what was Bisset's Hotel. I lived in the bigger house to the right of the lampstandard which is No.32. The ladies dress styles look Edwardian - circa 1910. Could the house on the left immediately after the flagstaff be number 7 High Street, where today only part of the old original garden wall at the north back remains with the new residence? The stone size and shape seems to match a photograph I took during a visit there in 2004. My great grandparents (Macdonald - the bootmaker) lived and traded there in the late 1800s. Dave, I used to live just across the road at number 32, so the house you mention is probably in the high 20s. The house at the flagpole is Bissets hotel, and the one next was used by the Douglas's and rented out to some airforce families.